Earlier this year I bought a pair of Alien Gear IWB Cloak Tuck holsters for some carry guns. I liked them enough (see review here) to pick up another one on the secondary market. The folks at Alien Gear have been keeping busy and I recently had the opportunity to try out some of their new products and accessories. One of the big features of Alien Gear products – aside from comfort – is their modularity. The Cloak Tuck IWB holsters consist of the leather backing, the Kydex shell, and front and rear belt clips – each with three different mounting positions to adjust for cant and ride height. The removable shell allows for swapping out shells if you change carry guns or if the shell gets damaged. This modularity is also the driving force behind a lot of Alien Gear’s newest offerings. The Cloak Tuck 2.0 holster is nearly identical in appearance to the original Cloak Tuck holster, but it is a big step up in comfort. This next generation of Alien Gear holsters replaces the thick leather backing with a neoprene composite backing. The neoprene backing is sandwiched between a pistol-facing vinyl layer and a soft skin-facing cloth layer. This cushioned base required no break-in time, conforming instantly to both the pistol and the wearer’s body. I wore the Cloak Tuck 2.0 12-15 hours a day for a couple of weeks. That wear included several 8-hour-each-way car rides, conventions, concerts and more – if that isn’t a good range of test conditions, I’m not sure what is. Throughout it all, the holster was very comfortable. Even at all-day outdoor events in humid, 90+ degree weather the holster didn’t feel “sticky” against the skin and, since neoprene is the same thing that wetsuits are made of, the pistol was protected from sweat. The cloth backing did hold a little bit of dampness, but it dried quickly and it wasn’t any less comfortable than bare leather would have been. 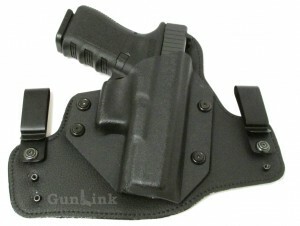 Although we did not try it out, Alien Gear has also recently released an OWB holster, dubbed the Cloak Slide. The Cloak Slide is essentially just another base that allows standard Alien Gear shells to be worn outside the belt. Original Alien Gear holsters came standard with thin, yet sturdy, steel belt clips that held the holster securely in place while remaining low visibility. Unfortunately, the tight fit of the steel clips can also scratch your belt. Not a big deal if you use a utilitarian carry belt, but if you wear a nice dress belt you may not want it scuffed up. If you are not a fan of the plain steel clips, for whatever reason, Alien Gear now offers a number of belt clip options, including the steel clips, standard nylon clips, leather loops, and more concealable J-clips and C-clips. All of the nylon clips feature countersunk holes that allow the mounting screws to fit flush, which eliminate the need for the washer and screw head to protrude above the clip surface and potentially saving wear and tear on your clothing. 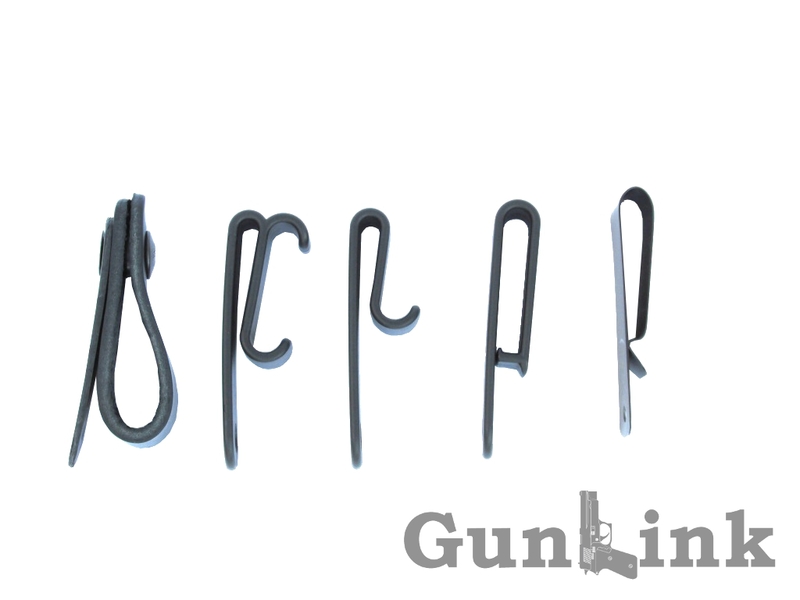 Each of the clip types offers a different look and fit. The original metal clips and the leather loops both fit belts up to 1.75″. The standard nylon clips are listed as fitting belts up to 1.5″, although it looks like they may be able to accommodate a 1.75″ belt, albeit with a close fit. 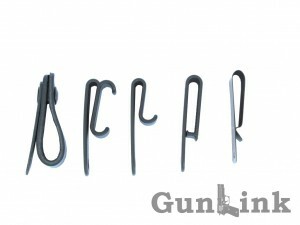 Both the C-clips and the J-clips are also listed as fitting up to 1.5″ belts. There are a couple of caveats about clip fit, though. 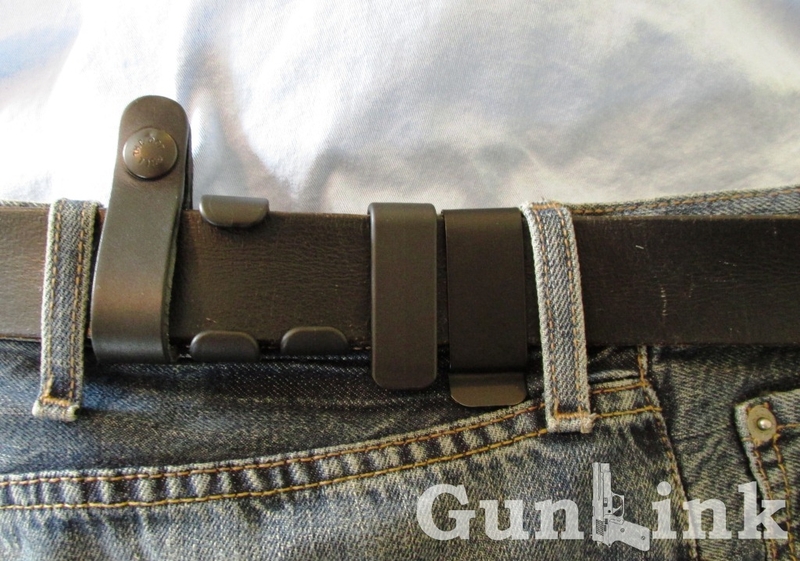 The construction of the leather loops makes the distance from the holster mounting screw to the top of the belt shorter than the other clips, causing the holster to ride higher when using these loops. If you like deep concealment and already have your IWB at the lowest ride height, these may cause it to sit too high. Next, although the J-clips are listed as accommodating 1.5″ belts, the distance between the hooks at the bottom of the belt and the top of the pants is closer to 1.25″. 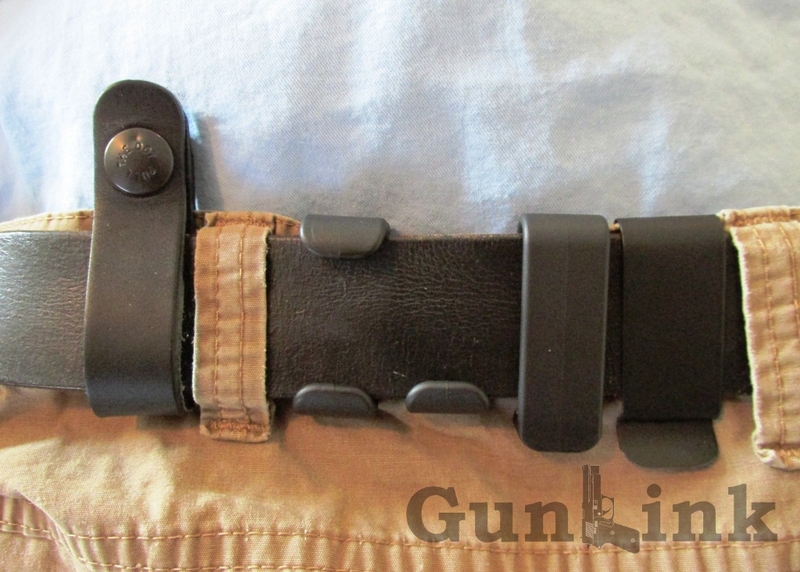 For bigger belts, this causes the clip to pull the top of the pants below the top of the belt. Have a look at the examples above to see how the different clips and loops look on jeans and slacks. Since the entire line of Alien Gear holsters (except, perhaps, those for revolvers) use the same layout for the shell mounting hardware, shells can be swapped back and forth between the Cloak Tuck, Cloak Tuck 2.0 and Cloak Slide models as well as swapping them out (for free) when changing pistols. Swapping is very easy, with all hardware and tools (hex key) included, and involves only removing four screws, swapping the shell, and replacing the screws. The whole shell-swap process took two or three minutes, even with the exchange being slowed down when some spacers stuck to the shell and some were stubborn and slow to come off of the mounting hardware. One of the things that we did notice during testing of both Cloak Tuck and Cloak Tuck 2.0 holsters was that the 2.0’s neoprene base was much less susceptible to taking on the imprint of the pistol than the leather base of the original model. As the leather-backed holster is worn, every detail of the pistol is pressed into the leather, allowing for a more custom-type fit. Even after weeks of wear, the neoprene backing of the Cloak Tuck 2.0 had only two small marks aligned with sharp edges of the pistol. This may not be a major concern if you will be swapping shells for similarly shaped pistols, such as the Glock series. However, the need to re-form the leather to a new pistol may be something to consider if you plan on swapping between vastly different carry guns. As announced following the Alien Gear/Old Faithful merger, prices for the original Cloak Tuck holsters are remaining at the eminently affordable $30 starting price with the OWB Cloak Slide holsters following the same pricing model. The Cloak Tuck 2.0 holsters are $36. À la carte holster components are available with belt clips in the $7-8 range, shells for $13 and various holster bases ranging from $17 to $23. The entire line of holsters and accessories, as well as Alien Gear swag, is available at aliengearholsters.com. I think I still like the metal clips the best. I am not sure whether they are actually better or if I am just partial to them because I have used them the most. They are the thinnest and seem to hold the holster in place the best. Next would be either the standard nylon clips or the C-clips. They are all good though; you would just have to pick the one that suits your needs the best. They need to upgrade their shipping times not just their holsters. It seems like I have been waiting forever on my regular cloak tuck.